It follows that the matrix appearing in Equation (A.89) is the inverse of that appearing in Equation (A.90), and vice versa. However, because these two matrices are clearly also the transposes of one another, we deduce that both matrices are unitary. In fact, it is easily demonstrated that all rotation matrices must be unitary; otherwise they would not preserve the lengths of the vectors on which they act. 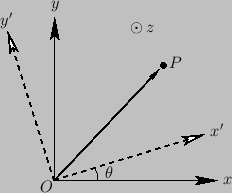 Figure: Rotation of the coordinate axes about the -axis.